Collegedale TN – July 2018… Collegedale Academy strives to provide an environment where spiritual growth and development among the students and staff is hailed and encouraged. Part by the Greater Collegedale School System, the school’s auditorium is used during the week for typical academic-related functions, including assemblies, presentations, and movies. 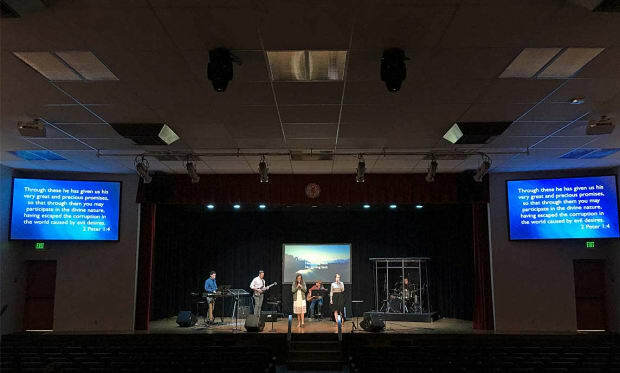 On weekends, the space is rented out to a portable church organization that comes in and configures the room for a praise and worship service. For both types of applications, clear, colorful visuals that inspire and motivate are crucial. To address these requirements, projection technology from Rancho Santa Margarita, CA-based Eiki International, Inc. was recently deployed. Creative Sound and Lighting Solutions of Cape Coral, Florida, an AVL design/build firm serving houses of worship, school systems, entertainment parks, and a variety of performance halls, was recently contracted to design and install a new projector setup for the auditorium. Rob Robinson, co-owner of the company, is actively involved in all aspects of its operation, including system design and implementation. After consulting with Collegedale Academy management, Robinson elected to install two Eiki EK-510U 7,000 ANSI Lumens WUXGA 3LCD projectors. He discussed the project and his reasons for selecting Eiki. To learn more about the services of Creative Sound and Lighting Solutions, visit the company at www.creativesoundsolution.com.